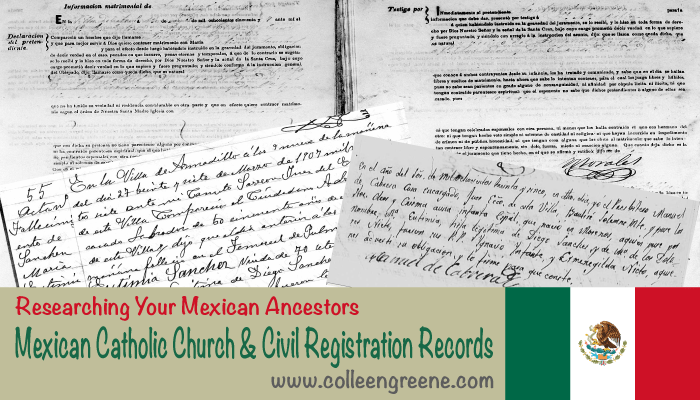 This post is part 2 in a new series I am doing on Mexican Catholic Church and Civil Registration records. Please read part 1 (“The Two Main “Go-To” Record Types for Researching Mexican Genealogy“) if you have not already done so. Federal census records are NOT going to be of help in determining your Mexican ancestor’s hometown or home state. They can be of help (depending on the census year) with identifying when your ancestor might have immigrated to the US., but not with identifying a specific place of birth in Mexico. Figure 1: The 1920 U.S. census record for my great-grandparents and their three oldest living children. 1920 U.S. census, Los Angeles County, California, population schedule, Long Beach Township, enumeration district (ED) 78, sheet no. 9A (penned), dwelling 167, family 251, Jose Robledo household; digital image, Ancestry (http://www.ancestry.com : accessed 28 November 2014); citing National Archives microfilm publication T625, roll 104. For my immigrant ancestors, I have not found U.S. vital records to be helpful for identifying a specific hometown or former place of residence in Mexico. These records usually simply note the country name as the place of birth. 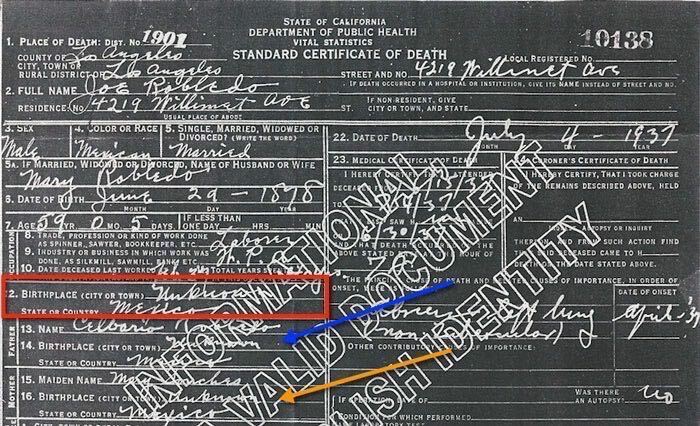 Figure 2: The 1937 California death certificate for my great-grandfather José Robledo. Los Angeles County, California, standard certificate of death no. 10138 (1937), Joe Robledo; County of Los Angeles Registrar-Recorder/County Clerk, Norwalk. Figure 3: The 1978 California death certificate for my 2nd great-uncle Juvenal Nieto. Los Angeles County, California, certificate of death no. 0190-003737 (1978), Juvenal Nieto; County of Los Angeles Registrar-Recorder/County Clerk, Norwalk. However, it is still important to carefully check these records for hometown clues. There are no doubt exceptions to my observation. You might be more fortunate than me, and come across a birth, marriage, divorce, or death record that does identify a more specific locality in Mexico. Obituaries, death notices, and marriage records can provide excellent clues about your Mexican ancestor’s hometown or home state. In this 1963 obituary for my 2nd great-grandmother Aurelia Nieto in a southern California newspaper, her children (the likely informants), note San Luis Potosí as the place where Aurelia’s family owned a ranch.5 San Luis Potosí is both a Mexican state and that state’s capital city. This record corroborates what my father and living family members knew—their ancestors came from San Luis Potosí—but it does not tell us if Aurelia came from just the state, or if she also came from the capital city. Figure 4: The 1963 obituary for my 2nd great-grandmother. “Matriarch Dies at 105; 21 Children,” (Long Beach, California) Independent, 16 February 1963, Home Edition, front page, col. 5. Military records—service records, pension applications, burial applications, and draft records—can be an excellent source for identifying your ancestor’s home state or hometown in Mexico. This record does not state the relationship between Juvenal Nieto and Aurelia Compean; we only know that she is his nearest relative. Figure 5: The 1918 World War I draft registration for Juvenal Nieto. “U.S., World War I Draft Registration Cards, 1917-1918,” database with images, Ancestry (http://www.ancestry.com : accessed 30 March 2017), card for Juvenal Joseph Nieto, order no. 4317, Butte, Montana. These combined pieces of information also demonstrate the importance of correlating information from all possible sources. Taken together, we now have evidence that my 2nd Great-Uncle Juvenal may have lived in San Luis Potosí, Mexico (city and/or state). The key point here is that we often have to consult and analyze multiple records to discover that key piece of information—in this case, the Mexican hometown or home state. Border entry records can also be highly valuable for identifying your ancestor’s hometown back in Mexico. But as with all types of historical records, some border records are more valuable than others, depending on what information about place of origin was asked, and how the immigrant might have understood the question. Was the border agent asking for the person’s state of origin, or for the city or town of origin? By place of origin, did the border agent mean where the person was born, or the place that person called home? Figure 6: The 1919 border crossing record for my 2nd great-grandmother Aurelia Compean. “Border Crossings: From Mexico to U.S., 1895-1964,” database and images, Ancestry (http://www.ancestry.com : accessed 31 March 2017), Laredo, Texas, 14 March 1919, Aurelia Compean, age 55. Tamaulipas shares a border with San Luis Potosí, and it is located in the northeast part of Mexico, on the Gulf of Mexico and along the Texas border. Nuevo Laredo, Mexico is situated across the Rio Grande from Laredo, Texas. 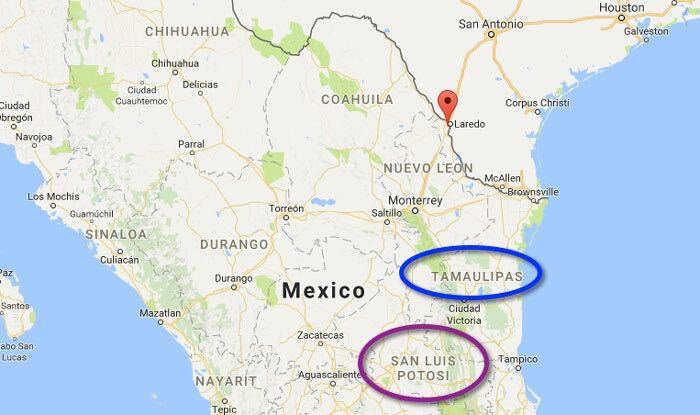 Figure 7: A screenshot from Google Maps, showing Nuevo Laredo (the red waypoint) in the northern tip of the state of Tamaulipas (in the blue circle), and the state of San Luis Potosí (in the purple circle). The border entry card for Aurelia (Figure 6) designates Laredo, Texas as the border entry point through which Aurelia entered the United States on 14 March 1919. Nuevo Laredo, Mexico—located across the river from Laredo, Texas—is recorded as her last place of residence. 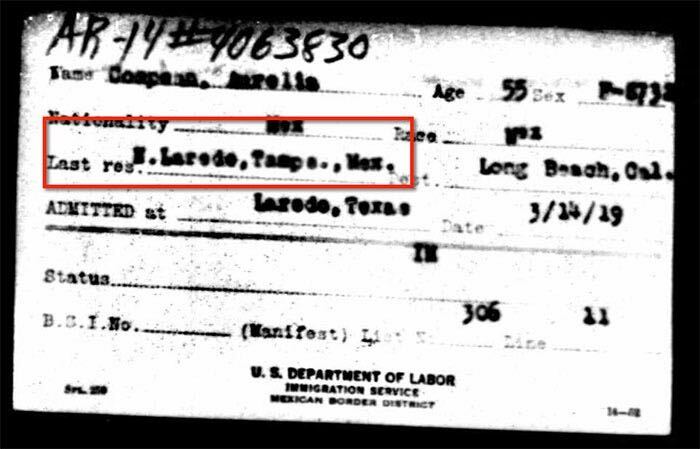 That is all we can determine from just this border record.12 The border record does not tell us if Aurelia was born in Nuevo Laredo, if she spent part of her life living in Nuevo Laredo, or if Nuevo Laredo was her hometown. Did she move from the state of San Luis Potosí to Nuevo Laredo? Or did she simply stay a night or two in Nuevo Laredo before crossing the border, and perhaps was confused when the border agent asked for her last place of residence (thinking he meant the last place she stayed)? Figure 8: The 1915 border entry card for my great-grandmother Maria Nieto, who entered at Laredo, Texas. 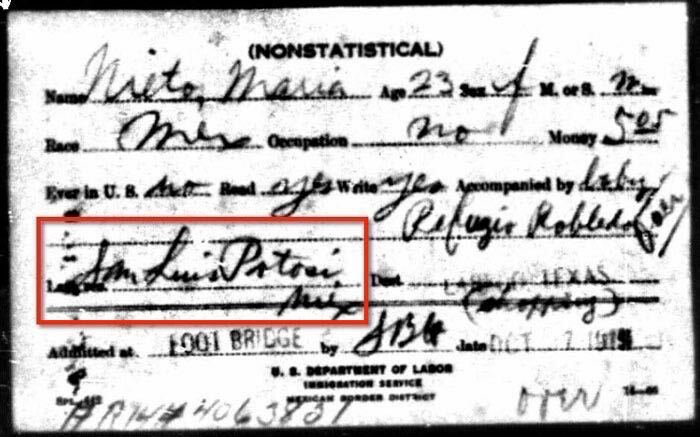 “Border Crossings: From Mexico to U.S., 1895-1964,” database and images, Ancestry (http://www.ancestry.com : accessed 20 June 2012), Laredo, Texas, 27 October 1915, Maria Nieto, age 23. Fortunately, sometimes these records note a more specific city or town. 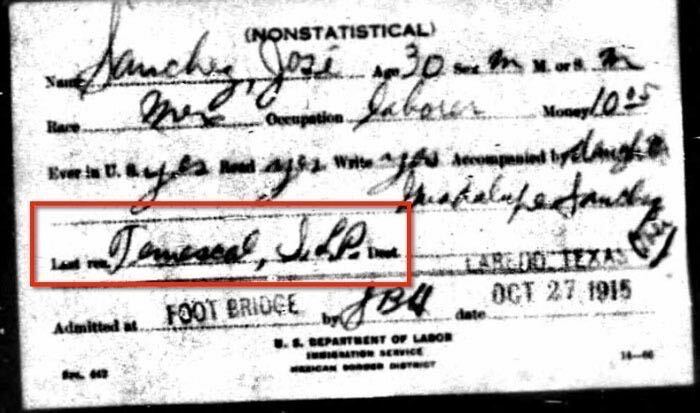 This 1915 border crossing record for my great-grandfather (Maria’s husband) José Robledo (recorded under the surname of Sanchez) reports his last residence as Temescal, S.L.P. (for San Luis Potosí). For now, one can infer that Temescal is a locality (a city, town, village, etc.) in the state of San Luis Potosí. 14 We will discuss researching place names later. Figure 9: The 1915 border entry card for my great-grandfather José Robledo, who entered at Laredo, Texas. “Border Crossings: From Mexico to U.S., 1895-1964,” database and images, Ancestry (http://www.ancestry.com : accessed 20 June 2012), Laredo, Texas, 27 October 1915, Jose [Robledo] Sanchez, age 30. Although not always the case, naturalization records are another source that frequently identifies your ancestor’s hometown back in Mexico. Figure 10: The 1954 U.S. Petition for Naturalization record for my great-grandmother Maria NIeto. 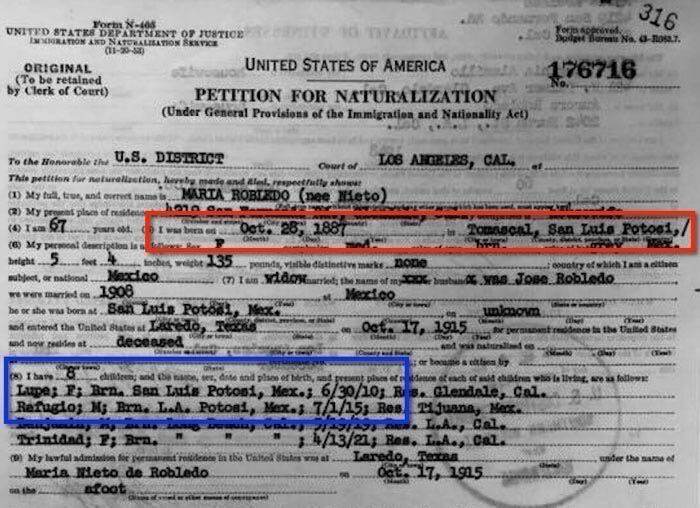 Maria Robledo (nee Nieto) petition for naturalization (1954), naturalization file no. 176716, U.S. District Court, Southern District of California; Record Group 21; National Archives–Riverside. Note that this Tomascal in San Luis Potosi seems to be the same place name (Temescal) written down by border officials as the last place of residence for Maria’s husband Jose Sanchez [Robledo] on his 1915 border crossing record. That border crossing record also indicates that José was accompanied by a daughter Guadalupe Sanchez [Robledo], who may very well be the Mexican-born Lupe noted on mother Maria’s naturalization record.16 So we now have a hometown clue for daughter Lupe too. My great-grandmother Maria Nieto reported on that 1954 naturalization record that Temascal/Tomascal, in the Mexican state of San Luis Potosí, was her place of birth.17 We have also identified Temascal/Tomascal as the last place of residence for her husband José, as reported on José’s 1915 border crossing record, which means that it was also probably Maria’s last place of residence in Mexico (not just her place of birth).16 So although we still do not yet have evidence that Maria’s mother Aurelia Compean or brother Juvenal Nieto lived in Temascal/Tomascal, that is still a good place to start looking for them too. 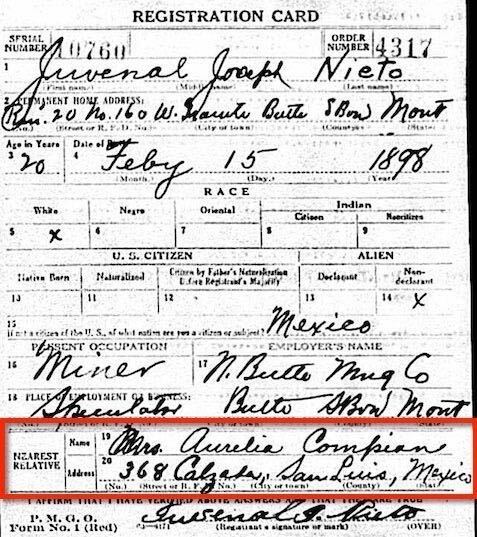 At the very least, we do know from his World War I draft registration that Juvenal thought his mother Aurelia still lived in the state of San Luis Potosí in 1918 (remember, her 1919 border record identifies Nuevo Laredo as her last place of residence).19 These are excellent clues for us to start locating this family in Mexican records! Let’s think about some of the big lessons learned here. 1) There is no single guaranteed type of U.S. record that will provide you with the name of your ancestor’s hometown in Mexico. 2) Don’t stop at just one record. You need to conduct a reasonably exhaustive search and look at all records pertaining to that ancestor. If I had stopped at just the obituary for my 2nd great-grandmother Aurelia Compean (Figure 4), I might have assumed this referred to the city of San Luis Potosí, instead of just to the state. If I had stopped at just the border crossing record for her (Figure 9), I would assume she was from Nuevo Laredo in the state of Tamaulipas. It is still possible that she actually lived in Nuevo Laredo before immigrating to the United States, but Temascal/Tomascal in the state of San Luis Potosí is now a strong candidate as well. 3) Check for records for every member of that immigrant family group…not just your ancestors (your direct line). You need to also mine records for extended family members. This technique is referred to as “cluster” or “collateral” genealogy. Aurelia Compean, her daughter Maria Nieto, and Maria’s husband José are my ancestors; they are part of my direct line. But Juvenal is not. He is my 2nd great-uncle, the brother of my great-grandmother Maria Nieto, what is called a collateral relative. But I had to review records for Juvenal to get clues about my 2nd great-grandmother (his mother) Aurelia in order to identify a strong candidate for Aurelia’s hometown in Mexico. Have you had success using other types of U.S. records to identify your immigrant ancestor’s Mexican hometown? We’ll get to clues in Mexican records later. But if you have tips to share for U.S. Records for Mexican immigrants, please feel free to post those as a comment below. I have used several civil record sites to find my potential Great Grandmother but no information comes up besides her christening. I had hoped maybe you could point me in the right direction. I have tried the mexicangenealogy, familysearch, ancestry, wiki, but nothing. The information I do have on her is her parents, dob, city. Christening records are not civil records; they are church records. So if you are searching or browsing for civil registration records in a church records collection, you are not going to find those civil records. As far as pointing you in the right direction, the right direction depends upon the research question you are trying to answer. This blog pot of mine does not go into research strategies for civil or church record sets; it provides instruction for identifying a Mexican immigrant ancestor’s hometown. Future posts in this series will walk through different strategies for finding records to address other research questions.